Android and Windows Phone are about as different as two mobile operating systems can get, so there's every chance you might want the features of both. So far for the most part you've had to choose just one unless you want to juggle two handsets, but a new phone will reportedly let you dual-boot Android 5.0 and Windows 10. The as-yet-unnamed phone is made by Elephone, a Chinese company you may not have heard of, but whose phones in many cases are available in the UK and US. 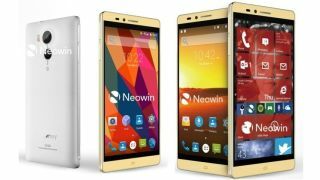 The upcoming handset will come in two flavours according to Neowin, the dual-boot variety and one which just runs Android, with the Android one launching in May and the dual-boot version set to arrive in June. Both versions have a 5.5-inch 1440 x 2560 display, 4GB of RAM, 32GB of built in storage, a battery which exceeds 3800 mAh and a fingerprint scanner. From the pictures it also looks like they may have a metal shell, so whichever version you get it's set to be a seriously high-end handset. There are a few differences between the two versions beyond their OS options though. The Android version will apparently have a 64-bit MediaTek octa-core processor, while the dual-OS version will have a quad-core Intel chipset. There will also seemingly be a slight difference in their cameras, with the Android variant rocking a 21MP Sony IMX 230 snapper and the dual-boot version equipped with a 20.7MP Sony camera. While still a rumour at this point it looks fairly convincing, the only red flag being that a June release for a Windows 10 phone is perhaps a bit early. We sure hope it's true though, because a dual-booter with those specs could be a beast and it's likely to come with an affordable price tag too. If you want a true Windows 10 flagship you might be in luck.